Project 1111 is the 1111-metres high sustainable vertical city with over 300 floors stacked in fifteen 20-storey tiers with hanging gardens and parks. Based on hexagon plan with 6 wings attached to spiral hexagon structure it creates the mix of transportation modes, including highways for cars (that can drive up to the top level), vertical transportation (zonal elevators and transiting express shuttles), airborne (copters/drones) and vacuum tube trains. The 350,000 population at 10,5 million sq.m. of total gross area (or 30m2 per capita – the comfortable living standards for a vertical urban habitat) are accommodated at 1.4km2 land plot. Unlike many futuristic paper concepts this is a first really buildable vertical city designed for many years of phased development without waiting for final completion, where safe and sustainable life and functioning of lower tiers are not obstructed by continuing works on upper tiers due to spiral construction sequence and simple technology of linear construction site. Spiralling sky-bridges at 1:20 slope allow the circulation of trucks and construction cranes during erection process : cranes move up the spiral inclined sky-bridges from building to building on completion of one tower structure to the other, and trucks can easily deliver the construction materials by the spiral highways arranged within the hollow sky-bridges structure(with few lanes in two levels in each direction), so the internal transportation between tiers, blocks and buildings remains to be conventional in a way, that each building can be accessed by car, taxi, ambulance and fire truck by the same highway road that during construction process was used for delivery of materials/equipment as well as for cranes moving up their spiral path. 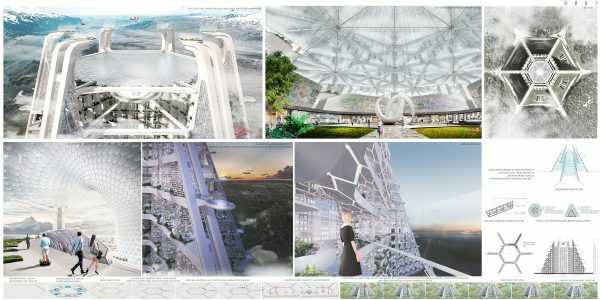 Vertical express shuttles(vertical and inclined multi-decker elevators) connect all 15 tiers at the ends and intersections of 6 wings with mass rapid transit stations, associated malls and car-parks at the bottom and with heliports for drones and copters carrying the people to/from the vertical cities. 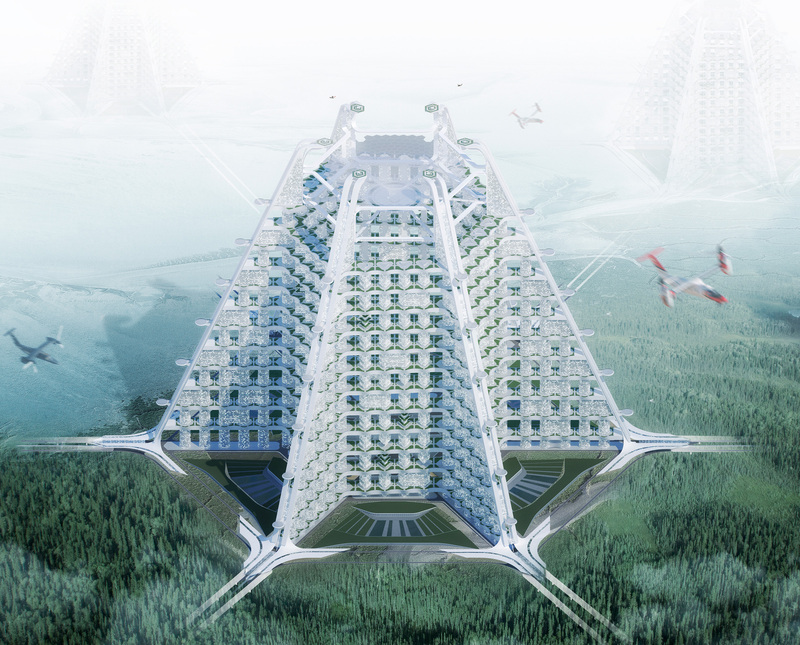 The structural mega-frame consists of the vertical modules (20-storey supporting blocks with vertical cores centred at 60m regular intervals) and sky-bridges inbetween arranged as tiers every 20 floors. Mega-supports work as vertical cores (filled with lifts and staircases) of 16-storey towers of different uses and functions (residential, office, educational, healthcare etc) accessed separately from the open pedestrian walkways along the hanging gardens arranged on top of spiral sky-bridges or by vehicles via car-parking blocks linked to the internal spiral highways. The 16-storey columnless buildings are built vertically along their cores using lift-slab technology. The Tower 1111 can be built with conventional construction machinery and equipment that is sufficient to build 16-20 storey tower, so it does not require the technological sophistication and can be technically realized in any country of the world. The structural rigidity and lateral stability of interlaced multiple vertical cores and sky-bridges with 6 inclined wings as buttresses provide very efficient and economical structural solution with negligible sway at the top. Fire escape from each 16-storey building/block to the safe area outside (hanging garden at sky-bridge roof) is easy and fast unlike the ones in skyscrapers. 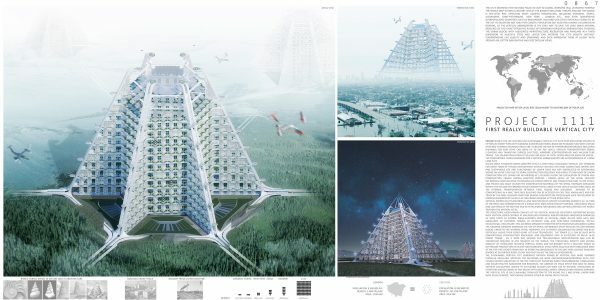 The sustainable vertical city generates enough power by vertical axis wind turbines installed regularly between the buildings (as wind catchers/concentrators) with ETFE funnel-shaped structure at the top vertically diverting wind flows/breaking turbulences and collecting the rainwater for residents. The absence of stack effect risk (due to zonal vertical circulation limited to 20 floors) allows for wide use of natural ventilation of functions and buildings at any height with balconies, green terraces and hanging gardens. The vertical city is fully walkable from bottom to top along the 1 km2 spiral linear park with 22km distance, that can be covered either by hiking or by cycling.